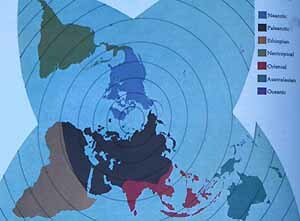 North America is separated from South America more biogeographically, with Central America considered part of the Neotropical Realm. The dividing line is ill-defined but is somewhere in the northern part of Mexico. Like the ABA, I include the Caribbean in North America (= the Nearctic Realm). The Oceanic Realm include all pelagic waters beyond the continental shelves (so that I include some of my California albatrosses and petrels as in the Oceanic Realm, although they are "countable" on ABA lists, state lists, county lists, and the like because they were within 200 nautical miles of the continent). All tiny uninhabited islands that serve solely or primarily as seabird colonies are also included in this grouping. The Antarctic Realm is just the continent of Antarctica and the major adjacent islands with penguin colonies. Since I've not been here yet, this page will have to feature a guest photographer. We live in a golden age. We are very lucky to be alive between the time when all the world's great birds were almost inaccessible, and the time when many may be gone forever. It is frightening for me to realize that at my (comparatively) young age of 47 years, I've already seen three species of birds that have already extinct in the wild. True, the California Condor may be on the way back to recovery with the captive breeding program (and some captives have been released back into the wild carrying bands and transmitters), and the Guam Rail still exists in captivity in another breeding effort. But the Guam Flycatcher Myiagra freycineti is gone for good. No amount of money or time or access or inside tips will get you a Guam Flycatcher. I shudder for generations to come. Yes, we are on the cusp between the good and the bad. Except when political troubles intervene, one can now get to almost anywhere in the world. In the 1970s, I thought the Arfak Mts. of Irian Jaya, New Guinea, were the end of the earth -- totally inaccessible both politically and practically. The endemics there were out of reach. Now its the 1990s; I've spent a week in the Arfaks; I've seen a good chunk of the endemics. What a great time! Further, the literature on world birding is exploding. We now have great field guides to most regions of the world, even those that had nothing portable when I first visited in the 1980s. 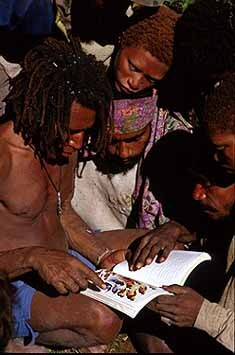 The dichotomy that is today is captured by Will Betz' great photo of New Guinea locals leafing through the new field guide for New Guinea (right; taken on the Huon Peninsula, 14 mi. south of Teptep, Papua New Guinea, in July 1997 © Will Betz). New handbooks or family tomes are published almost every month. A good overview on the world & regional handbooks recently published or underway is in Salzman (1999). I have highlighted these and other sources on the Realm pages, including great new sources of information and entertainment as the Neotropical Bird Club, the African Bird Club, and the Oriental Bird Club. Stuart Keith wrote a wonderful article in Birding magazine in 1974 that had great impact on me. Entitled "Birding Planet Earth," it talked about how many species of birds there were (then estimated at 8,600; now thought to be about 10,000). The difference is due primarily to changing philosophies in taxonomic concepts [an essay on taxonomy and similar topics is here] and the challenges involved in finding any significant percentage of them. He asked "is 7000 possible?" for any single observer? Little did he know that rapid advances in technology, in transportation, in politics, and in birding expertise would allow dedicated world birders to surpass 7000 and then 8000. Little did he anticipate that the first one over 8000 would be a retired schoolteacher from Missouri (Phoebe Snetsinger) who took up birdwatching at a time she thought (taking her doctor's word) that she had only a few months to live! Keith also highlighted some of the great birds of the world. In talking about the difficulty in locating many species, he made this classic statement: "Tough birds like Yellow Rail, Boreal Owl and Ross's Gull are a snap compared to elusive myths like the Congo Peacock, the Long-tailed Ground-Roller of Madagascar and the Great Argus Pheasant of southeast Asia." I have wanted to see the Peafowl, Ground-Roller, and that Pheasant ever since -- and fortunately I'm two-thirds of the way there! [only the Congo Peafowl remains elusive on a personal level... and likely always will....]. To tour or not to tour? This is a good question, and the answer will be different for each individual. Tours (at least the good ones run by Field Guides, or Wings, or VENT, or KingBird (phone 212-866-7923), or Sunbird or others (in U.K.), or other high quality professionals like such small family-run companies as Cheesemans' Ecology Safaris) are led by very experienced birding guides, usually with a good collection of tape-recordings, and with specialized knowledge of the areas to be visited. The company takes care of all your food and accommodations and, if you wish, your airline reservations. You are likely to see more species of birds on a tour than a similar length trip "on your own" to the same area, even if you are well-prepared with detailed bird-finding information and tapes of your own. However, by taking a tour, you are stuck with whatever group of other people happened to join that trip, and sometimes this mix of personalities or varying levels of expertise or energy will wipe out all the tour's advantages. You are basically "buying birds" and missing out on the excitement of finding and identifying your own birds. You will have to share all the big optical equipment (many leaders carry high-powered scopes) with everyone else, so while you get great views they are often very quick and hurried. You will miss some birds because you were at the front or back of the line in the forest, or in the van, or in the canoe -- engendering a level of frustration in some that is much worse than not knowing the bird was just there. Trips on your own have a lot more hassles with planning, accommodations, transportation, and figuring out just what that damn bird is anyway (it's not in the guide!!). But on your own you get the indescribable joy of finding and identifying your own bird; of choosing to linger over a great view, or follow a bird to watch behavior, or have time to take photos; of setting your time and pace. Perhaps the best of all worlds are small groups of friends that travel together, share expenses and experiences, and delegate the duties among the group. These types of trips were more common, it seems, back at the time of Stuart Keith's article (1974); now, it seems harder to put together such groups because so many are just taking the tours. I do enjoy a certain level of comfort -- even in the third world when possible -- and so do not sleep in the car, do not subsist on peanut butter, nor skip the morning coffee or the evening beer. I have maniac friends who readily do all those things to see birds. I have spent nights in native huts in New Guinea, or slept in hammocks in the Amazon Basin, and marched through a lot of mud -- but these measures are taken when that is the best options available. If there is a nice lodge in which to stay -- with a bed, mosquito netting, and a fan -- I'll take that any day. Safety is also always a concern. Tours seem to offer more safety, but I know of instances when birders have been assaulted on tours to New Guinea and bitten by poisonous snakes on tour in Peru. A friend of mine was killed by a tiger while leading a tour to India. There are also the horrible examples of tourist killings by rebels in natural areas of Uganda while on tours. Yet single birders & small groups have also encountered danger. A British birder was killed by the Shining Path insurgents in Peru a decade ago; more recently, American birders were held hostage by rebels in Colombia. Birders I know have been robbed and beaten in Costa Rica, shot in the Florida everglades, or suffered burglaries in their motel rooms in Australia. I had all my luggage, camera gear, exposed film and passport stolen from a van in Venezuela while at lunch (which is why I can't show the nice Sunbittern photos I'd taken on the trip). These tragedies can occur anywhere -- even in your home town. I do not consider world birding to be particularly risky if one takes some common sense precautions, but it is wise to know the politics of an area you plan to visit. Peru was dangerous for a time, but is now much safer. Africa has perhaps become more dangerous recently. Irian Jaya was closed to western tourists for much of the century, open for a few short years, and then closed again. Cuba is now hosting visitors. Times and circumstances do change. So, for me, there is no clear answer. I go on my own (or with my partner Rita) or in small groups when I can. However, there are places in the world that require languages, logistics, expertise, and red tape that would be exceptionally difficult to handle alone, and for those places I have taken tours. To Madagascar, and to Sumatra, and to Gabon, or Irian Jaya, for example. But trips to Malaysian Borneo, Papua New Guinea, Ecuador, Peru, Caribbean, South Africa, Kenya, Australia, New Zealand, and New Caledonia have all been undertaken alone or with just 1-3 friends. As always, moderation and common sense are the better part of the solution. A final note: I trust that no one who reads this far will think that I am somehow one of the world's top birders. Far from it! I'm interested and I've traveled a bit, but have much less experience than many others. True top world birders are included, though, among my friends. Bret Whitney has managed to make a living leading bird tours, but has greatly contributed to science between tours. He has discovered new species of birds in Brazil, Madagascar, and elsewhere, and studied the biology & ecological requirements of many obscure tropical species while remaining comfortable with the North American avifauna. Peter Kaestner joined the American diplomatic corp and has been posted to Africa, New Guinea, and South America, becoming an established expert on each continent; he also discovered a new species to science. The late Ted Parker, with whom I birded in his hometown of Lancaster, PA, back when he was a teenager, became the world's best neotropical birder before his untimely death in a plane crash while doing bird surveys. Tom Schullenberg, whom I knew from California birding in the 1970s, has taken up some of Ted's "rapid assessment" projects in the South America wilderness while separately becoming a world expert on Madagascar. Brian Finch left overcrowded Britain to take a management job in Papua New Guinea and was widely regarding as "Mr. New Guinea" before he moved to east Africa; the last time I ran into him was in the field in Ecuador! Stuart Keith, a Brit transplanted to America, focussed his studies on Africa and is a leader in the Birds of Africa handbook series. He was among the first to travel the world widely to learn about all its birds. These are among the world's top birders. Beyond this top rank, there are hundreds of birders with enough time and money to have traveled much more than I; some take up to 6-8 foreign trips a year [I'm lucky to manage one every two years]. Other energetic birdwatchers without family, mortgages, or permanent jobs are able to travel months at a time. Yet another set are full-time tour leaders to far distant destinations. All these observers have added much to our understanding of our planet. I'm just fortunate to have followed in some of their footsteps. Austin, O. L. 1961. Birds of the World: A Survey of the Twenty-seven Orders and One Hundred and Fifty-five Families. Golden Press, New York. Keith, G. S. 1974. Birding planet Earth -- a world overview. Birding 6: 203-216. Salzman, E. 1999. Bird books of the golden age. Birding 31: 38-55.